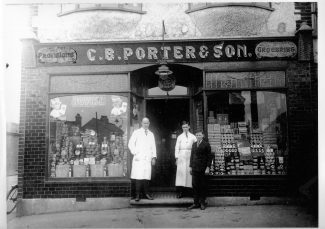 Information: To the visitor at the Hadleigh History Fair who had photos of Porter`s shop and wanted to discover where it stood and to find out more about the family. Thanks very much for your information. I have still not proved exactly where the shop was situated in the High Street but I suspect it was one of the shops on the south side between the Castle Inn and End Way. They disappeared in the 1960s but if this is the right place, the shops fronted large houses so I suspect the family probably lived behind and above the shop. CB Porter was my Great grandfather 1854-1929 and he had 2 sons, Charles and Wallace. Their address was the High Street so I presume they lived at or near the shop. Bob. Earlier Belchams in the High Street was an outfitter owned by the Yeaxley family, who later built a new shop in the London Road to the east of the old Kingsway cinema. Ian. Scofield and Martin’s was on the north side of the High Street at the west end of the row of shops from the Church, I may have got the order wrong and missed a shop, but next door was Dossetts the bakers then a chemist and then Belcham the post office, the last was a small second hand shop. This would be in the 1930’s. Thanks, Ian. I do not know where the grocer’s shop you refer to was situated. I would be grateful for further information if you have it, please. 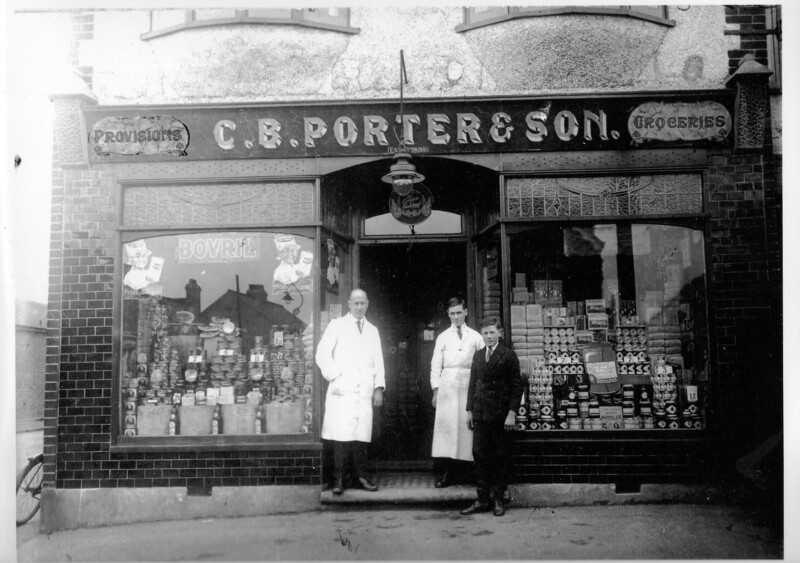 Could this be on the site in the old High Street which was later in the 1930s Scofield and Martins, grocers.